By getting vaccinated for the flu on Oct. 15, you will not only be keeping yourself healthy this winter. You will also be helping out the Syracuse University Health Center and the Onondaga County Health Department. That day, a flu clinic will be held from 11 a.m. to 3 p.m. in Flanagan Gymnasium, open to all University students, faculty and staff members. Michele Frontale, supervising pharmacist for the Health Center, says the organizers hope to give as many as 2,000 flu shots in that four-hour period. Frontale adds that the clinic will be staffed by personnel from the health center and from the county health department. The flu vaccine given will be formulated to fight the most common types of flu predicted for the upcoming flu season. 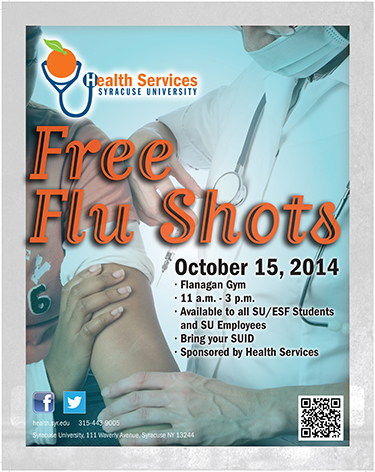 The flu vaccine will be free for all who attend the clinic, but you must bring a valid SU ID.